Last summer, I had the opportunity to return to the village in Samoa where I served as a Peace Corps Volunteer and reunite with my host family for the first time since I had left more than 30 years ago. Carrie Hessler-Radelet during her service in Western Samoa, 1981-83. She served as a Volunteer with her husband, Steve. One of the most unforgettable moments of the trip was my reunion with my host sister Rosela, who was only 11 when I completed my Volunteer service and returned to the United States. As a Volunteer, I started a library at the school where I taught, and many nights I would bring books home to Rosela so that she could read aloud to me in English. As it turns out, after I left Samoa, Rosela continued to work hard at her studies. She earned scholarships first to Samoa’s best boarding school and later to undergraduate university and then law school in New Zealand, where she finished at the top of her class. Rosela returned to Samoa where she became the nation’s leading female lawyer and earned the title of matai – one of her country’s chiefly titles. I was awestruck as Rosela shared the story of her accomplishments with me – all these years, I had no idea what had become of her. So I asked her the reason for her phenomenal success. After all, she came from a village where few young women even dreamed of a future outside their village. Rosela told me that it was the love of her parents and her father’s support for her education that had made the difference. Her father, Viane, was a subsistence farmer who never had a day of formal education in his life. But he and Losa, Rosela’s mother, worked hard in the fields so they could afford school fees, books and uniforms for each of their nine children. Every day, Viane told his children how important it was for them to study hard and excel in school so they would not have to live in poverty as he did. For my host sister, that support and encouragement made all the difference in the world. But we know that not all girls are as fortunate as Rosela – not when more than 62 million girls around the world face barriers that keep them from attending school and achieving their potential. This October 11, we commemorate International Day of the Girl Child in recognition of girls’ right to education and the unique challenges they face around the world. The adolescent girls that I have met in my travels have so much potential – such big hopes and bright dreams. But all too often, those dreams are cut short by circumstances beyond their control: early and forced child marriage, unwanted pregnancy, gender-based violence and cultural beliefs that girls are less worthy of an education than boys. Expanding girls’ education is not just a matter of building more schools or constructing better roads. To truly change the future for 62 million girls – and their families, their communities and their nations – we must also address the cultural beliefs that close doors and deny opportunities to these amazing young women. They need buy-in from the most important stakeholders in their lives: their parents – especially their fathers. We need fathers around the world to see what Viane saw in Rosela: the amazing promise reflected in her eyes; the creativity and intellect she brought to her work; the energy and passion she inspired in others. 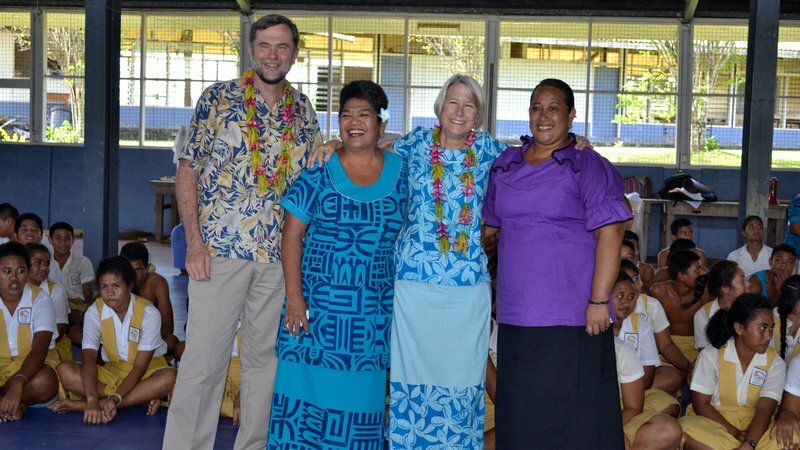 In 2015, Director Carrie Hessler-Radelet returned to Samoa and reunited with her host family, including sister Rosela. Girls like Rosela are the reason that the Peace Corps joined President Obama and the First Lady to launch Let Girls Learn, a whole-of-government initiative dedicated to opening doors to education for girls around the world. For the Peace Corps, Let Girls Learn builds on 55-plus years of experience of working with girls, women and communities at the grassroots level. Living and working alongside the people they serve, our Volunteers speak the local language and understand the local culture. They know how to win the support of village chiefs, and how to connect with parents and families. 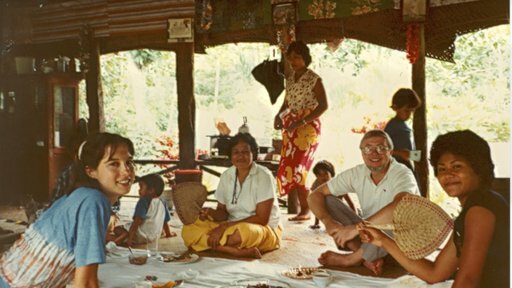 After all, Peace Corps Volunteers aren’t visitors in their countries of service – they are trusted, often beloved members of their communities. That’s why, when it comes to addressing some of the most stubborn barriers to girls’ education, Peace Corps Volunteers are uniquely positioned to help local leaders, families and girls themselves implement lasting solutions. Sometimes those solutions address physical or economic barriers, such as ensuring access to latrines, building dormitories or teaching girls valuable trades that can help them pay for books, uniforms and school fees. And sometimes those solutions mean changing attitudes – helping communities encourage fathers to support their daughters’ dreams while still holding fast to their most important values and traditions. In the past year, we have more than doubled the number of countries implementing Let Girls Learn programming for Peace Corps Volunteers and communities. We have funded more than 300 community-led projects, such as the Good Father Project in Mongolia. Together the Peace Corps, the Department of State, the U.S. Agency for International Development and the Millennium Challenge Corporation – led by the President and First Lady – have brought together an unprecedented coalition of global leaders, private sector partners and ordinary Americans dedicated to opening doors to education for even more girls around the world. As we celebrate International Day of the Girl Child, you can join our efforts by participating in the Department of State’s “Dads and Daughters” campaign and chiming into the global conversation to support dads, daughters and gender equality. To learn more about how you can support girls’ education and empowerment, please visit https://letgirlslearn.gov/take-action/. Carrie Hessler-Radelet, the 19th Director of the Peace Corps, served as Director of the Peace Corps from 2014-17. Prior to this, she served as the agency’s acting director and deputy director from 2010–14. She is a returned Peace Corps Volunteer from Western Samoa.